Biʿtha (Arabic: بِعثَة) means selection of prophet by God for guidance of people. The Prophet Muhammad (s) in the age of forty in the Hira' cave in Mount Nur (close to Mecca) has been chosen as prophet and the first verses of Qur'an 96 has been revealed to him. The Bi'tha, according to Shiite point of view, was the beginning of Islam and occurred in Rajab 27, 13 lunar years before Hijra (June 25, 610). Before the mission of the Prophet (s) began, most people of that region were idol-worshiper. Other divine religions had some followers in different places of that region. However, after the beginning of the mission of the Prophet (s), Islam expanded and idol-worshiping was wiped away from Hijaz. The anniversary of the beginning of the mission of the Prophet (s) is among the celebrations of Shiite and is known as Eid al-Mab'ath. The word derived from Arabic "ب ع ث" (Ba', 'Ayn , Tha') root which means sending, exciting or dispatching. In the technical meaning, Bi'tha means sending a human by God toward other humans and jinn to guide them to the right path. The word is mainly used for the Prophet (s) when he was chosen as prophet. The word Bi'tha in Qur'an indicates a special stage of life which has a kind of transformation therefore besides the meaning of becoming prophet; it also refers to resurrection in hereafter. However the dominant meaning is selection and sending someone as prophet. In all of the Qur'an, Bi'tha is always attributed to God, that is, resurrection in hereafter, special rules of universe, and sending the prophets show the mightiness of God and his program in ruling the world. The prophets have been chosen among the people themselves to be the same type. Even though that choosing prophets from among the people sometimes is followed by ridicule and denial of polytheists and their pride and spite, it has a reason and wisdom that is introducing exemplar to people to follow, as prophets has been described in Qur'an. If prophets have been chosen from other beings than humans, they couldn't be exemplar for humanity and this is one of divine traditions that the prophet of each group should be from among them to be able to represent the religious message completely. With the differences in the appearances, the religion of most people of the peninsula was idol-worshipping. In Yemen, worshipping the moon and the sun was common. They considered the moon as the god and the sun as the goddess. Names such as 'Abd al-Shams, 'Abd al-Shariq, 'Abd al-Najm and 'Abd al-Thurayya are examples of this kind of worshipping. Worshipping spiritual concepts and invisible forces was the creed of some others. Worshipping stones and woods was a form of idol-worshipping. The temple of 'Uzza was three trees in a place between Mecca and Ta'if called Nakhla. The great idol of the people of Mecca and Quraysh was Hubal. Worshipping annoying spirits such as jinns, demons and afreets were also common in some parts of the peninsula. Also, divine religions the natures of which were transformed had followers in different parts of the land. Judaism was common in Yemen, Wadi al-Qura, Khaybar and Yathrib, among the tribes of Banu Qurayza, Banu Qaynuqa' and Banu al-Nadir. Tribes of Taghlib, Ghassan and Quda'a in the north and Yemen in the south were Christian. Zoroastrianism and Buddhism existed in the north-east and Sabaeans' teachings were common in Yemen, Harran and northern regions of Iraq. 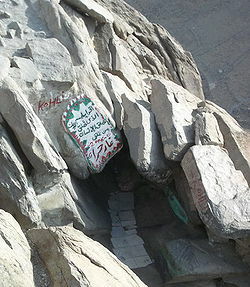 There were also few people who kept away from these creeds and stayed for some days in seclusion; as it is mentioned in some narrations that 'Abd al-Muttalib, the grandfather of the Prophet (s) took tahannuth for the first time during the month of Ramadan in the cave of Hira'. When the month of Ramadan came, he went to the cave of Hira' and gave food to needy people. After him, others such as Waraqa b. Nufil and Abu Umayya b. Mughayra followed him and stayed there until the end of the month. However, maybe they did not gather in one place such as the cave of Hira', but their seclusion was in the month of Ramadan which suggests the people's respect for the month of Ramadan and it can be a sign that this habit had an older origin and history. Those who had chosen such a manner and in general, those who were against idol-worshipping were called "Hunafa'" or "Ahnaf" (plural form for "hanif"). "Verily, Allah sent Muhammad (s) as a warner (against vice) for all the worlds and a trustee of His revelation, while you people of Arabia were following the worst religion and you resided among rough stones and venomous serpents. You drank dirty water and ate filthy food. You shed blood of each other and cared not for relationship. Idols were fixed among you and sins were clinging to you." Bi'tha of the Prophet (s) has occurred when he was forty and there is a less known opinion that it has occurred when he was 43. The origin of these different ideas related to the different understandings of the meaning of Bi'tha, some believes that criteria of being prophet is receiving the first verse and others believe that the first public invite is the criteria of being prophet. And later, the revelation was continued by the first verses of the Qur'an 74. He told about his prophethood first to his wife Khadija (a) and his cousin 'Ali (a). For three years the Prophet (s) didn't invite people in public, rather he would invite secretly and the new Muslims would perform religious acts in secret. and thus his mission reached to a new level by inviting his kinsfolk to Islam. by the revelation of this verse his mission became public and for the first time the prophet (s) declared his divine call in the 'Ukaz bazaar where people were gathered for trade and some of them had a session for new poems and different stories and he asked all for their attention and stated his divine message. The first time that Jabra'il (Gabriel) came to the prophet (s), this encounter was along with majesty and feeling of a great burden of prophethood and it has been narrated that after this encounter prophet went to his home and asked his wife: "Cover me" but no wondering or ambiguity were narrated about this encounter because the prophet (s) was ready and capable of having connection with the angel of revelation and the invisible world and the prophet (s) before seeing Jabra'il, has seen its works. In his childhood because of his purity and his hate of corrupted atmosphere of Mecca in that time, he was interested in soleness and isolation from the city. He used to go for one month isolation in the mountains close to Mecca and he had some dreams about the invisible world and he had three years of relationship with the Israfil and 20 years with the Jabra'il before his Bi'tha and therefore he was ready when he received the first message from God. If we accept these narrations, we find other narrations doubtful that state that the Prophet (s) was unfamiliar with revelation and angels and he was suspicious and afraid of distracted consciousness or being attacked by jinn and because of these doubts he had consultation with Khadija (a) and got confirmation from Waraqa b. Nawfal as witness of his prophethood and calmed down with his consolation. This kind of narrations is in conflict with growing stages and the training atmosphere that the Prophet (s) had and it is also against his vision and perspective of the great burden of prophethood. Bi'tha has a very remarkable position among Muslims. It actually is the beginning point of Islam, the religion that in its early years had few followers and difficult circumstances and later expands to whole world and attracted numerous hearts. Beginning of all of that crucial change is Bi'tha. According to historians, this great event happened on Monday in the Rajab 27 in the fortieth year after 'Am al-Fil and 13 years before Hijra (June 28, 610) which was the 20th year of Khusru Parwiz's government in Iran. There are other opinions which believe that Bi'tha was in 17th or 18th of the month of Ramadan or in one day of Rabi' II, nonetheless Shi'a believes in first idea. Mab'ath (day of Bi'tha) is a great eve in all Islamic countries and among all Islamic denominations and in this day all Muslims have celebration with their special cultures. The material for this article is mainly taken from بعثت in Farsi WikiShia. This page was last edited on 24 February 2019, at 04:04.